BEIJING - The first visit to China by a Japanese foreign minister in two years has signaled a thaw in ties between Beijing and Tokyo amid continuing rows over territorial and historical issues, but some experts remain skeptical that relations will improve further, given the differences in regional strategies. 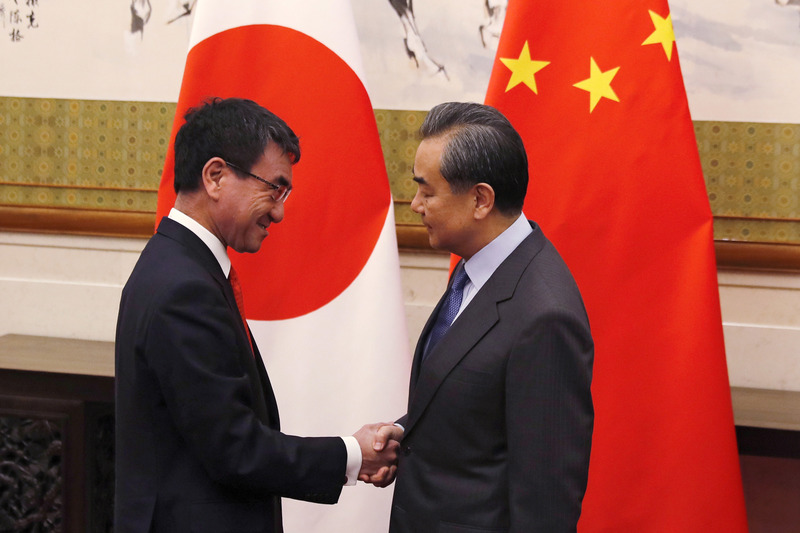 Foreign Minister Taro Kono’s visit to Beijing comes at a time when Japan and China mark 40 years since the signing of a bilateral peace and friendship treaty, and after both Chinese President Xi Jinping and Prime Minister Shinzo Abe have bolstered their domestic power bases. Optimism has grown about the future course of Sino-Japanese relations, as Xi and Abe are expected to be able to move ahead with negotiations on various matters in an atmosphere where they can exert strong leadership. Fears about North Korea’s ballistic missile and nuclear ambitions have also prompted Beijing, its main economic lifeline, to work together with Tokyo to maintain security in East Asia. On Sunday, Kono agreed with Chinese counterpart Wang Yi that Beijing and Tokyo will make efforts to improve ties and resume reciprocal visits by their leaders. For years, Japan and China have been mired in a territorial row over the Japan-administered Senkaku Islands in the East China Sea. China claims the uninhabited islets as Diaoyu, and Taiwan as Tiaoyutai. The dispute escalated particularly after Abe’s predecessor Prime Minister Yoshihiko Noda decided to effectively bring the Senkakus under state control in 2012 amid a bidding war with former Tokyo Gov. Shintaro Ishihara, an outspoken nationalist. Against that backdrop, Xi and Abe have never held talks in the format of an official visit since both took office in 2012. The lack of in-depth communications signified the fragility of the relationship. The situation, however, changed late last year as the two leaders solidified their grips on power through key internal political events, a Foreign Ministry official said. Following the Chinese Communist Party’s twice-a-decade congress last October, Xi began his second five-year term alongside a team stacked with trusted allies, which has given him leeway in mending ties with Japan, the official said. Analysts echo that view. 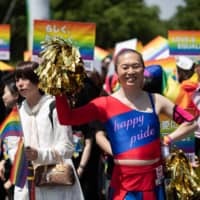 Tatsuhiko Yoshizaki, an expert on foreign issues at the Sojitz Research Institute, said, “Chinese leaders who have a weak power base have often tried to pressure Japan,” aiming to garner political support at home. 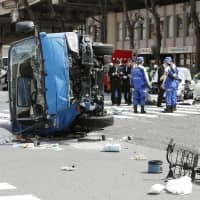 Abe consolidated power by leading his ruling bloc to a two-thirds majority in the powerful House of Representatives in the snap election in October. The victory puts him on track to become the longest serving postwar prime minister. Stephen Nagy, a senior associate professor of politics at International Christian University in western Tokyo, said mounting tensions with North Korea have provided China and Japan an opportunity to reconsider their ties. Abe believes “there is no solution to the North Korean nuclear crisis without China. 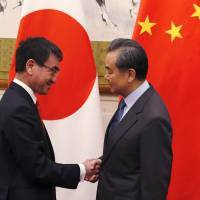 Warming Sino-Japanese relations may encourage China to put more pressure on Pyongyang,” Nagy said. China also views North Korea’s nuclear weapons program as a “big” risk and has decided to improve relations with neighbors Japan and South Korea to “concentrate their diplomatic efforts” on Pyongyang, Nagy added. China is worried about radioactive fallout from nuclear testing and the likelihood of war triggering a massive influx of North Korean refugees. But even as Beijing and Tokyo try to create an amicable environment, territorial and historical issues are likely to prevent them from building friendly ties, said Jeff Kingston, director of Asian Studies at Temple University Japan. “Fundamentally, there is deep permafrost in (China-Japan) relations due to disputes over history, territory and strategic rivalry, so there is a push to promote warmer relations on the 40th anniversary . . . but relations are tense,” Kingston said. In his meeting with Wang in Beijing, Kono lodged a protest against a Chinese submarine that was found earlier this month in the contiguous zone around Japan’s territorial waters near the uninhabited islets. The Foreign Ministry official acknowledged it is difficult for Beijing and Tokyo to find common ground over issues related to the Senkakus, saying the two sides should exchange views in a way that will not stop the momentum they’ve built toward improving bilateral ties. The official indicated Japan-China ties may also hinge on how Tokyo will deal with Beijing’s strategy to promote regional economic development. In recent years, China has been seeking to expand infrastructure networks in Asia, the Middle East, Europe and Africa to achieve its goal of connecting countries under its “One Belt, One Road” initiative. Abe has advocated a “free and open Indo-Pacific” strategy apparently designed to counter China’s assertiveness at sea in the Asia-Pacific region, with concerns persisting over Beijing’s transparency for its financing.